Waiting on Mongo will perform at Langosta Lounge Sept. 4. 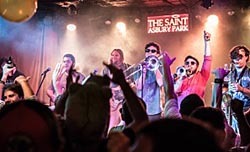 It will be a funky time on the Asbury Park boardwalk this Sunday as Waiting For Mongo- an Avon-based band, takes the stage at the Langosta Lounge. “Our music like a funky dance party,” band spokesman T.J. McCarthy said. “They are a soulful stew of funk and heavy grooves. These guys make everybody get up and dance,” restaurant entertainment director Peter Mantas said. The band will play at the Langosta Lounge, 1000 Ocean Avenue, Sept. 4 just after the Asbury Park beachfront fireworks are over. Admission is free. Band members are Mike “Mongo” Iatesta (keys, guitar); T.J. McCarthy (bass, vocals); Matt “Baby Mongo” Iatesta (drums); Mike Susino (guitar, vocals); Bruce Krywinski (trumpet, flügelhorn); Anders Carlson (sax); and Johnny Carlson (trombone). The band plays cover tunes and original material. “We’ve been friends who love music and basically decided to play music together. Some of us started jamming six to seven years ago and then, after three years, we decided to get more serious and we just got better,” he said. “We are always waiting on him,” McCarthy said. “And the Langosta Lounge is a great venue. It’s fun and right on the boardwalk. It’s one of our favorite places to play and our fans love it,” he said. During the day band members work a range of jobs, including teaching, lifeguarding and bartending.